In the second major product launch in as many days, Google has released Google Voice. This will be an online calling service that utilizes voice over IP (VoIP) technology to deliver free and cheap calls. Similar to services like Skype, this will include free calls to other users and cheap domestic and international calls to landline or mobile phones. This is all accessed and managed through an online Google Voice dashboard, which will be tied to a new or existing Google account (Gmail account). There, users can make calls — including conference calls of up to six people — and also sign up for a phone number through which incoming calls are routed. In other words, it will simultaneously forward calls (and texts) to home, work and mobile phones. The product will also come with a handy voicemail system that utilizes a speech-to-text processing engine, which lets you listen to or read voicemails. The underused (in my opinion) Google Talk IM client already lets users call one another (using a headset) and leave messages that are turned into MP3s and delivered in a Gmail message. But calling actual phone numbers is new, as is the speech-to-text feature. Google has slowly been improving its speech recognition technology for the past few years through GOOG-411, which we’ve long believed will be applied to other areas (i.e., transcribing and indexing video for better searchability). Generally speaking, voice as a content format has likewise been a potential ad unit for Google for some time. It has rolled out voice search through GOOG-411 and its voice search application on the iPhone. It’s also made moves in (and away from) radio. In all these cases, it’s working to improve its speech-to-text processing and create inventory in call volumes, which can be monetized with audio ads. In this case, audio ads can be applied across many of these products: voice search, directory assistance, radio and calling services. Knowing Google, these ads will likely be placed in a targeted fashion involving a mix of contextual, behavioral and geographic targeting. To clarify, this is mostly our speculation on future direction, and ad targeting isn’t included in the launch plan. Meanwhile, get ready to hear lots of snappy sound bytes and comments that this will be a “telco killer.” We won’t see that happen just yet, as it competes more directly with VoIP services like Skype. Skype has a sizable head start with 400 million registered users and 350,000 added every day, but if anyone can reach this scale, it’s Google. Google call rates will also undercut Skype’s for domestic and international calls. More importantly, users can access Google Voice by calling from a normal phone and tapping into the system of voice prompted options. One of the barriers to online VoIP services like Skype is that buying, setting up and using a headset or Skype phone isn’t a mainstream-friendly solution. 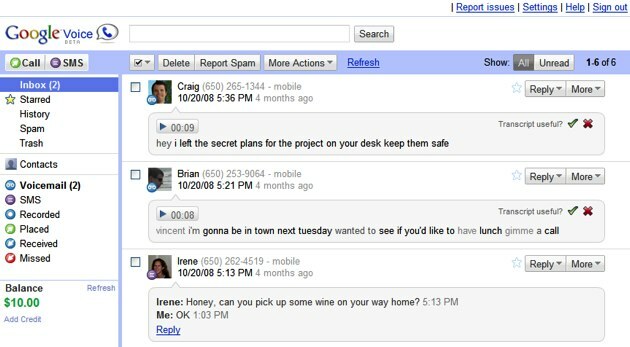 Google Voice will be the eventual result of the 2007 acquisition of GrandCentral, and will only be available to existing users of that service for the time being. Watch: Short videos about Google Voice features are available on the company’s YouTube Channel. Google once again come up with the best application, I love this idea but one thing that comes to my mind that will Google take over other less popular VoIP services like Vopium, Jajah and truphone? anyways I love Google Voice! Yes, it’s pretty cool. It could take share from the providers you mentioned but they still have subtle differentiators. Truphone is great for cheap voip calls from a cell phone that can work on wi-fi (doesn’t use up your minutes). Google Voice does use up your minutes because you are essentially routing a call through a google toll free number. But for this same reason, it could be cool for long distance calls from land lines – again call is routed through a toll free number at a rate that is much less than dialing long distance directly with your land line. Lots of directions this could go.